Friends of the Earth today hand delivered a submission to the Victorian Red Tape Commissioner calling for the Napthine government’s anti-wind farm laws to be investigated. 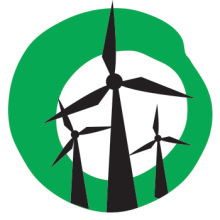 The Coalition introduced the world’s worst anti-wind farm laws in 2011. The laws ban wind farms in the windiest parts of the state. The submission sets out the adverse impact of the laws on businesses and the broader economy. The Napthine government’s anti-wind farm laws have stalled the wind energy sector, costing Victoria projects worth $864 million, 402 construction jobs, and 64 ongoing jobs. Yes 2 Renewables and community members have been making the case for the government to rip up these anti-wind farm laws from the first sitting day of the 2014 parliament. 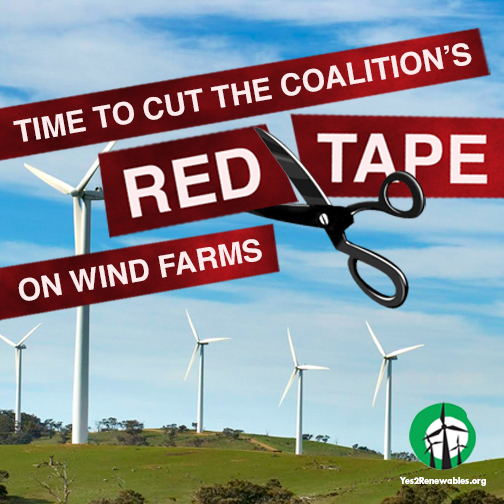 After a year of inaction from Premier Napthine, we are here on the final sitting day of the year calling on the Red Tape Commissioner to investigate the government’s anti-wind farm laws. The government’s blanket ban on wind farms killed off the push for a community project near Woodend. “The current planning laws mean that it’s ok for Daylesford to have a community wind farm, but yet, just 40km away in Woodend, a project of similar scale is prohibited,” said Barry Mann of the Macedon Ranges Sustainability Group. Wind worker Adam Gray has observed the impact of the anti-wind laws, including job losses in the sector. The Victorian government released its energy policy — Victoria’s Energy Statement — on Monday Oct 13. It missed the opportunity to reform its anti-wind farm laws. The Victorian Labor party has vowed to ‘rip up’ the Coalition government’s anti-wind farm laws if it forms government. 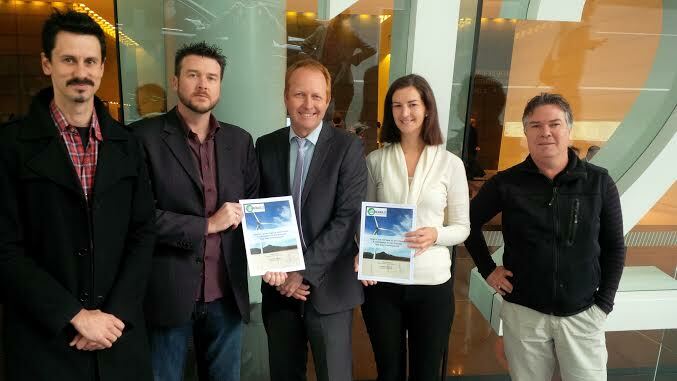 The Greens also support reforms to restore fair laws to wind farms in the state. Greens leader Greg Barber and Ellen Sandell (candidate for Melbourne) support our submission to the Red Tape Commissioner. They joined wind worker Adam Gray and Macedon Ranges local Barry Mann at the commission’s HQ this morning. The commitment by the opposition and Greens is a welcome first step that will win votes in the upcoming state election. Ripping up the Coalition’s anti-wind farm laws is just the first step to kickstart the wind energy sector. Yet we need a Victorian Renewable Energy Target to unleash investment and create jobs in our state – which is something all political parties can support. The ACT has a renewables target of 90% by 2020. South Australia’s target has been lifted to 50% by 2025. Victoria doesn’t have one and is falling behind. With the election fast approaching, time is running out for the major parties to back a Victorian Renewable Energy Target and secure a future sector. Sign our petition calling on Premier Napthine and opposition leader Daniel Andrews to encourage renewable energy jobs by setting a Victorian Renewable Energy Target. This is great news. Napthine and his predecessor have been in denial for use on this issue and their pretence that the walls are fair while coal mines and other genuinely noisy industries can exist much closer to residences makes the laws even more of a farce. Gough made us proud and confident. The fearmongering Coal-ition make us ashamed and insecure. It’s TIME.